Port Moresby needs to fund relief programs properly and raise awareness in high-risk areas before disasters strike. On Monday 26 February, an earthquake measuring 7.5 on the Richter scale hit the highlands region of Papua New Guinea. Its effects throughout the Southern Highlands and Hela provinces were disastrous, and tremors continue to cause damage in the Enga and Western provinces. There are reports of 30 to 50 people dead, and pictures filtering through social media show the significant level of destruction caused. As is the case with most natural disasters in PNG, the rural population has been the worst hit. In this case, a significant number of PNG’s extractive industries projects are located in the affected areas and have had to close operations. The mining industry responded more swiftly than the PNG Government to the earthquake. On the day of the disaster, the mines began evacuating non-essential staff. While some reports say the PNG Government sent Defence Force personnel and “assessment officers” to the affected areas on the same day, others suggest government personnel did not arrive until Tuesday 27 February. Importantly, no official account of the number of deaths and scale of the destruction has been released. On 1 March, three days after the earthquake hit, the PNG Government announced a state of emergency, a 450-million kina relief fund, and the establishment of an Emergency Restoration Team to “manage and coordinate all restoration activities”. The PNG Government also approved the establishment of an authority to manage restoration over the next four years. Details of the government relief program, including who will lead it, remain unclear. How the PNG National Disaster Centre will contribute to the clean-up is also unknown. The National Disaster Center falls under the Department of Local and Provincial Level Government Affairs (DLPGA), and its mission is “to provide national leadership in the development and maintenance of measures to reduce risk to communities and to manage the consequences of disasters in Papua New Guinea”. The United Nations Development Programme (UNDP) has stated that “PNG is one of the most disaster-prone countries in the Pacific region”, and that “every year the country experiences two to three large-scale disasters, and numerous smaller localised disasters”. Recognising this, in 2016 the UNDP in partnership with the PNG National Disaster Centre began working together to set up PNG’s first integrated information system to ensure the availability of accurate and timely information. However, the status of this project is unknown and there is no mention of it on the National Disaster Center’s website. Notably, the website also contains no updates on the current earthquake situation; in fact, its last news update was on 7 December 2016. In that update, the National Disaster Centre announced it would be transitioning into a commission, and that the PNG Law Reform Commission would create legislation to enable this move. As a former employee of the Law Reform Commission, I remember endless meetings conducted on the matter, but no prioritisation of the issue by either entity. It seems to be a growing tendency in PNG for government offices to strive for more independence as “commissions” and “authorities” outside the provincial and local frameworks; however, it is not clear how much more effective this will make them in practice. The answer is not more legislation. The Disaster Management Act 1984 is a very brief piece of legislation establishing the National Disaster Committee and its functions, and the National Disaster Centre. Thus, the operations of the National Disaster Centre are already largely dependent on policy. PNG’s Vision 2050 plan, which encompasses the country’s short- and long-term development strategies, aims at attaining sustainable development through disaster-relief measures and climate change adaption. In 2012, PNG released its “Disaster Risk Management Plan” in line with this vision, which offers an appropriate framework within which to address natural disasters in PNG. Yet the government continues to respond to disasters in an ad hoc manner. This earthquake is PNG’s second major natural disaster of 2018, following the Kadovar volcano eruption in January. 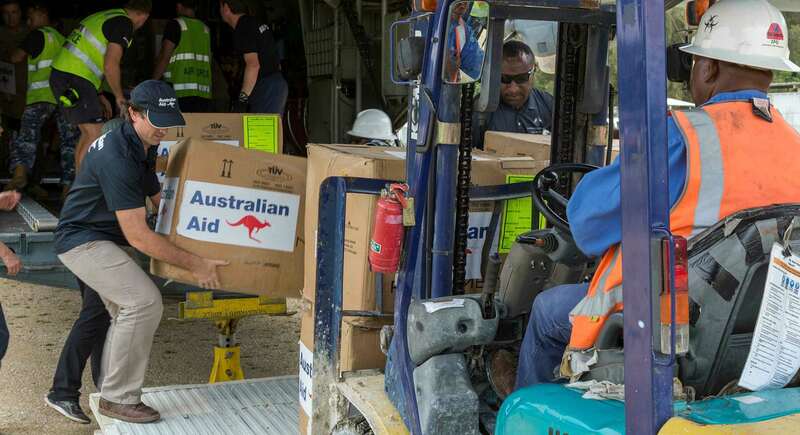 Again, we see NGOs carrying out their own relief programs, and the private sector coordinating directly with each other – even foreign governments seem to be coordinating via the private sector – presumably because they cannot wait for the PNG Government to get its act together. The continuing challenge for the PNG Government is to kickstart the existing framework for responding to natural disasters into motion. The policy foundations seem to be in place; now it is a matter of funds and using them appropriately to not only react to natural disasters with relief and restoration programs, but also to premptively monitor possible natural disasters and raise awareness of these events in high-risk areas.